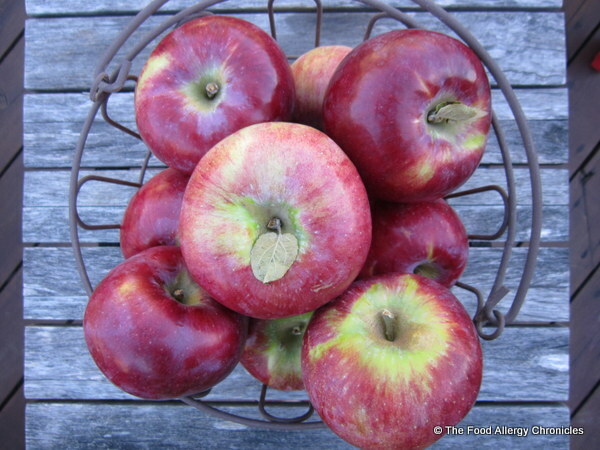 Posted on October 5, 2012 by Susan H.
Are you as happy as I am that apple season is here! Despite the late frost in spring…I was delighted to see local apples for sale! I picked up these local Cortland beauties at MacMillan’s. This past weekend, our family celebrated my father-in-law’s birthday. Since I had not baked a fruit pie/crostata all summer and I know how much my father/mother in-law love them…it seemed like the perfect opportunity! The beauty with making a fruit crostata is it only requires half the dough required for a pie. Thus, with a couple extra family members, two crostata’s from one pie crust recipe was perfect. 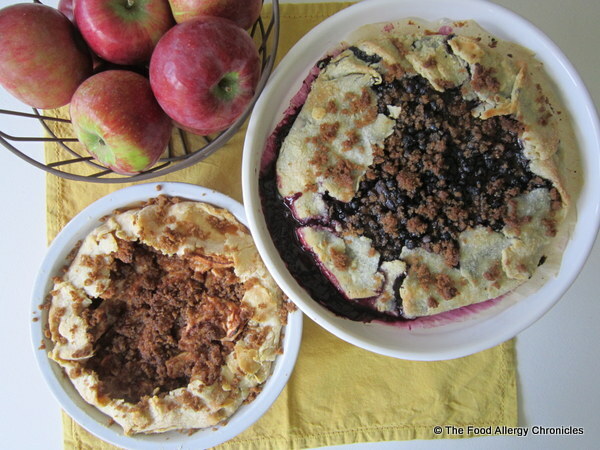 This pleased both my boys as they each prefer different fruit pies…apple and blueberry. As a full meal was planned…Rotisserie Pork Roast, Roasted Mini Potatoes with Onion and Roasted Maple Sweet Potatoes with Carrots, steamed Yellow and Green Beans and Dairy, Egg, Soy and Peanut/Tree Nut Free French Stick (a must at all occasions)…I decided to start my baking in the morning. While waiting for the Dairy, Egg, Soy and Peanut/Tree Nut Free French Stick dough in the bread machine, I started on the Dairy, Egg, Soy and Peanut/Tree Nut Free Apple and Blueberry Crostata’s. By the time I had finished baking the two Crostata’s, the Dairy, Egg, Soy and Peanut/Tree Nut Free French Stick dough had finished in the bread machine, I had rolled out the two french sticks and let them rise. I was ready to just pop them in to the oven. When the bread was finished, the oven was free for the roasting of the potatoes and veggies later in the day…Andy was in charge of the rotisserie pork on the barbecue. With all the gorgeous smells emanating from the oven…the boys could hardly wait for dinner! As we knew we would not be able to celebrate a Thanksgiving dinner with Andy’s parents the following weekend, it was really lovely to have them over this past weekend. 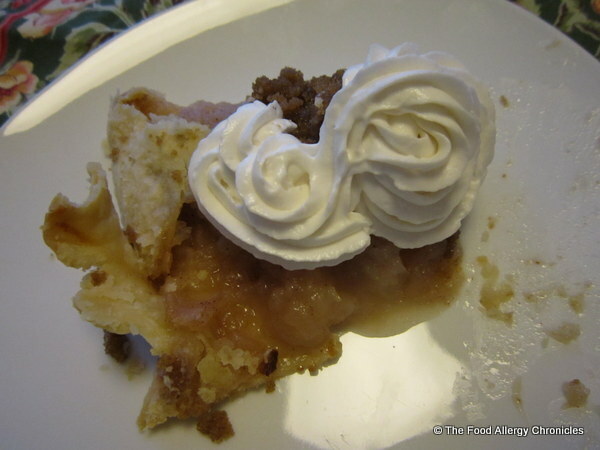 Stay tuned to the end of this post to discover the secret surprise I had waiting for Michael’s slice of Dairy, Egg, Soy and Peanut/Tree Nut Free Apple Crostata! 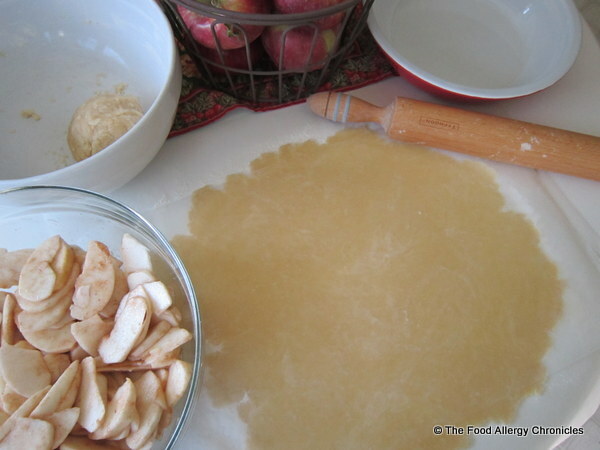 Click here for the recipe for my Dairy, Egg, Soy and Peanut/Tree Nut Free Pastry and the ingredients for the apple filling. Once you have made the Dairy, Egg, Soy and Peanut/Tree Nut Free Pastry and the apple filling, divide the dough in half. Using a rolling-pin, roll out the dough to fit a pie plate. Use fingers to help ease up rolled dough from bottom sheet of wax paper. (this can be a bit finicky) More detailed photos on the above link to the pastry. Carefully transfer the dough to a pie plate or parchment lined baking sheet as in the version baked for the Dairy, Egg, Soy and Peanut/Tree Nut Free Blueberry Crostata described below. Remember:Pastry dough is very easy to piece back together. Patch work the bottom layer of pastry dough to cover the pie plate if needed. Neatness is not required as it will still taste delicious. Combine all ingredients in a small bowl with a fork or with your fingers until it is all crumbly. 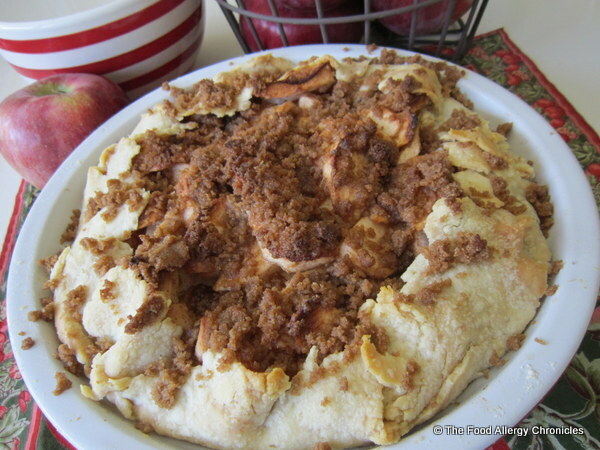 Sprinkle half of the crumble topping over the middle of the apple filling. Bring up the overhang of pastry, pressing the pastry together as you go along and sealing the edges. 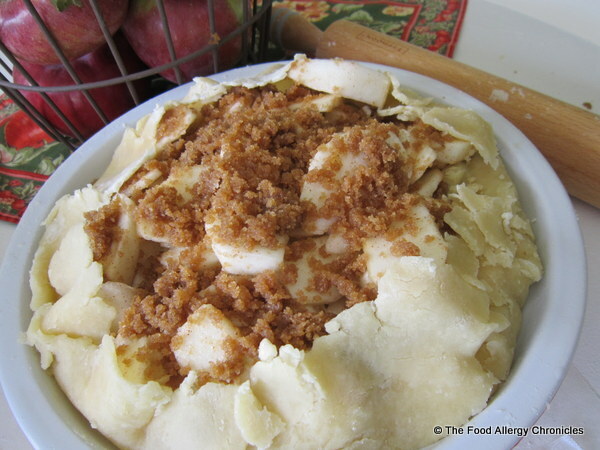 Bake 450F for 25-30 minutes or until apple filling is bubbly and edges of pastry are browned. Measure all the above ingredients in a medium-sized bowl. If blueberries are frozen, let stand 15-30 minutes before moving on with the directions. Follow the same directions with the second all of pastry as described above, except have the bottom layer a piece of parchment paper or silicone pad. Once pastry has been rolled out, it is easy to transfer the pastry on the parchment paper to a baking sheet and simply peel off the top layer of wax paper. Pile the blueberry filling in the middle of the circle of pastry. Sprinkle with the rest of the crumble topping reserving a bit for the top of the folded over pastry. Fold over the pastry edges, pressing the cracks together and sealing the edges. 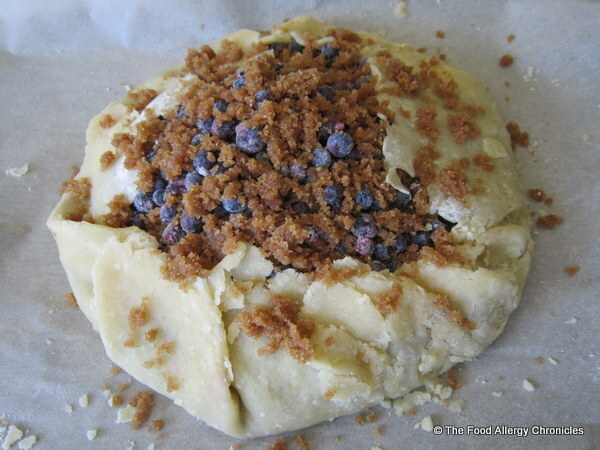 Bake 450 for 25-30 minutes or until the blueberry filling is bubbly and the pastry is browned. Do not fret is the filling escapes a bit…it’s bound to happen. Secret Surprise: The little surprise I had tucked up my sleeve for Michael…a dairy free topping…Soyatoo Rice Whip Topping! Check this out! Everyone got in on the action and tried some on their slice of Crostata. The verdict….Michael, “It’s good“…Matthew “It’s awesome” It does not taste exactly like real whipped cream…however, Matthew, who loves whipped cream, has been squirting it on all his leftover slices. P.S. Happy Thanksgiving…enjoy your weekend! I will be spending most of mine in hockey arenas…how about you? Has anyone tried Soyatoo Rice Whip Topping? What are your thoughts? Have you discovered a new product to introduce to your child/children with food allergies? 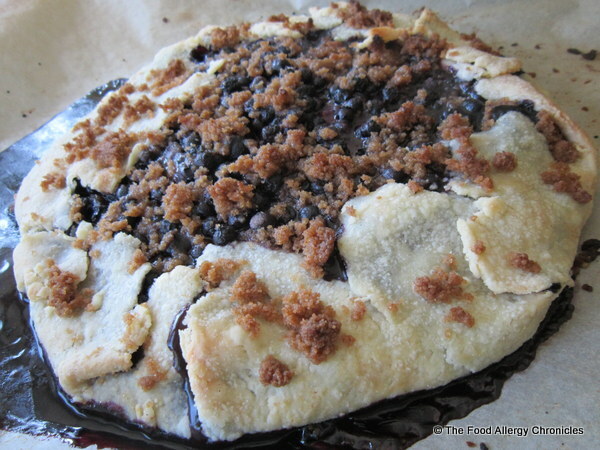 This entry was posted in baking, dairy free, dessert, egg free, multiple food allergies, peanut/tree nut free, pies, sesame free, soy free and tagged allergen friendly crostata, Dairy Egg Soy and Peanut/Tree Nut Free Apple Crostata, Dairy Egg Soy and Peanut/Tree Nut Free Blueberry Crostata, Dairy Egg Soy and Peanut/Tree Nut Free Pastry, Soyatoo Rice Whip Topping by Susan H.. Bookmark the permalink.